A unique 80,000-seat stadium will be the flagship venue for the London 2012 Olympic Games. An innovative design allows for the stadium – which will host the opening and closing ceremonies and the athletics events – to be converted into a more easily maintained 25,000-seat permanent venue after the Olympics, when it will become a new home for athletics, combined with other sporting, community, cultural and educational uses. An Olympic stadium with such a large demountable element has never been attempted before and the design represents the start of a new era for Olympic stadium design; more use of temporary elements combining the high-level performance needed for a major sports event alongside the long-term needs of the community. A sunken bowl built into the ground for the field of play and lower permanent seating, designed to bring spectators close to the action. A cable-supported roof that will stretch 28metres the whole way around the stadium, providing cover for two thirds of spectators. A 20m-high fabric curtain, or wrap, that will encircle the 900m circumference of the stadium, acting as additional protection and shelter for spectators. Artists will create a large mural on the wrap of historical sporting champions, participating countries’ flags and sponsor logos, giving the stadium its distinctive appearance. Self-contained pod structures, which will house catering and merchandising facilities, adding to the spectator experience around the access level of the stadium. Prime Minister Gordon Brown was on site to see construction officially begin on the stadium for the London Olympics on 22nd May 2008. By September 2008, more than 100 columns, each five metres tall had been constructed to support the podium of the stadium’s west and south stands. This also forms the lower ground floor of the west stand, which houses athletes’ changing rooms and other back of house facilities, such as doping control and treatment rooms. The foundations for the stadium were also nearing completion, with more than 3,500 of the 4,000 permanent piles installed in the ground. 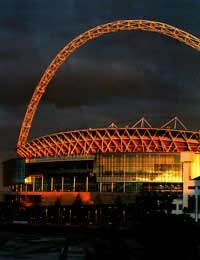 Team Stadium have been given the task of constructing the main venue for the London Olympics, having already worked on Arsenal’s 60,000-seat Emirates Stadium, and Telstra Stadium (formerly Stadium Australia). The latter, venue for the 2000 Sydney Olympics, held 110,000 spectators during the Games and was reconfigured to 80,000 seats after the Olympics. Construction on the stadium for the 2012 Olympics is due to be complete in 2011, in time for test events to take place before the Games.